I have stayed in the New York Marriott Marquis on Broadway, New York City, many times and I am sure I will choose to stay there many times in the future. It is impssoible to improve on its location for me. 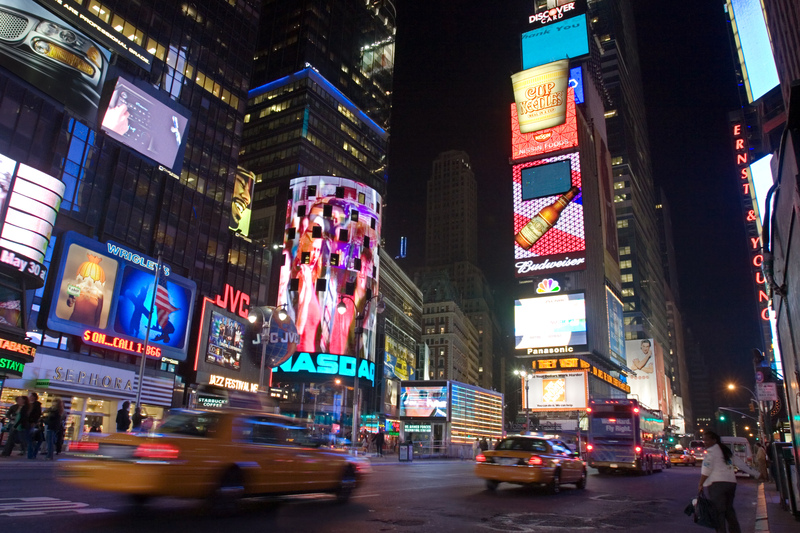 It is set in the Theatre District of New York City and a block from Times Square. Indeed, the very first time I stayed there I had a direct view of the famous Times Square Coca-Cola billboard. is located inside the New York Marriott Marquis so I can go to watch a Braodway show without even going outside. When I am there in January, it is great to avoid the cold. It provides maximum comfort for audiences while conveying a feeling of intimacy. The venue features wide aisles, comfortable seats, ample restrooms and parking. Since its opening, the theatre has showcased a series of hit musicals including Me and My Girl, Gypsy, Victor/Victoria and Annie Get Your Gun. 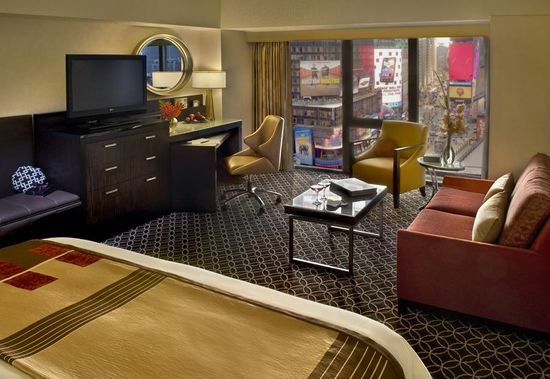 Admittedly there are hotels with fancier rooms than those in the New York Marriott Marquis. However, its straightforward rooms feature floor-to-ceiling windows, flat-screen TVs, WiFi and coffeemakers. Some rooms also have pull-out sofas, and suites add living rooms. Dining options include a stylish revolving restaurant, The View, on the 47th and 48th floor of the hotel. It is the only revolving restaurant in NYC and offers excellent food in relxaing surroundings. There is also a casual eatery on the 8th floor, the Broadway Lounge and a Starbucks cafe at ground level. My favourite is the Broadway Lounge which recently got bigger, with the opening of two beautiful new outdoor patios which overlook all the excitement of Times Square below. I like to find a comfortable perch 8 stories above the bright lights at one of the cocktail tables and enjoy a glass of wine. It is different and exciting. If it is cold outside, I enjoy the view of Times Square from the warmth of the bar inside.There is also an efficient business center, a wide variey of meeting rooms, and fitness facilities. However, there is no swimming pool. WiFi is free in public areas but a small charge is made for this in the rooms. I really like the New York Marriott Marquis. it serves me well whether I visit the city for business or pleasure. I recommend it and will use this hotel again. 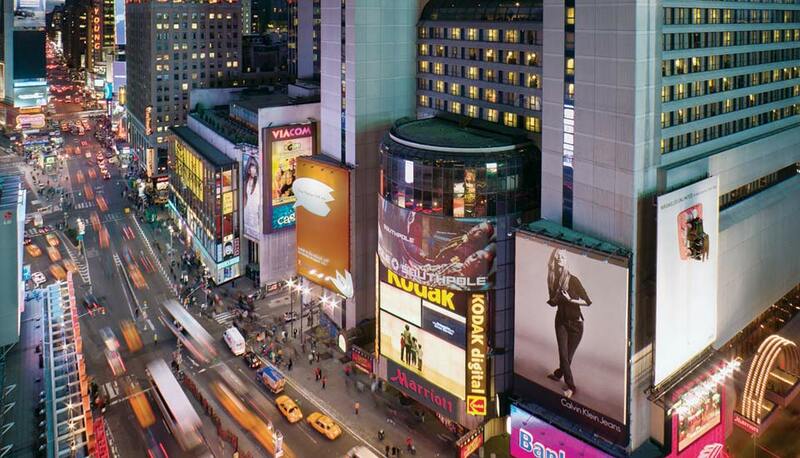 It has a perfect, central location in Times Square.